Careful craftsmanship and outstanding value make this item a must-have accessory! 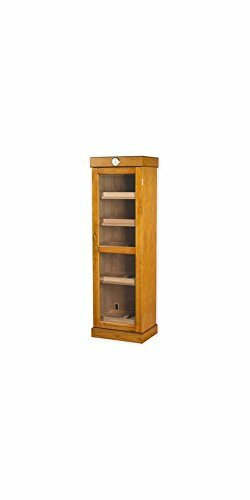 This attractive, affordable cigar tower features 5 shelves, tempered glass door, glass hygrometer and cavernous interior that holds 3000 cigars. A comprehensive unit that may be the last one you'll ever buy! Holds up to 3000 Cigars. Tempered Beveled Glass Door. 1 Glass Hygrometer with Brass Frame. 5 Shelves (3 adjustable) for Box Storage. 5 Removable Trays with Dividers. Lined with Premium Kiln Dried Spanish Cedar. Gold Plated Lock & Key, Knob and Hidden Piano Hinges. 2 Interior A/C Outlets. Does not include humidification. Available in Golden Oak finish. 22 1/2 in. W x 16 1/2 in. D x 72 in. H. Capacity: 3000 Cigars.